I need to travel. Nice dog. Need to feed him once a day. Rat Terrier. Quite. Calm. No Medication. Sleeps most of the time. Does not need a walk.I need to travel. Nice dog. Need to feed him once a day. Rat Terrier. Quite. Calm. No Medication. Sleeps most of the time. Does not need a walk.I need to travel. Nice dog. Need to feed him once a day. Rat Terrier. Quite. Calm. No Medication. Sleeps most of the time. Does not need a walk. I don't want letters from my HOA. Sweep or vacuum as needed. Water yard. Schedule lawn care. Basically house needs to appear occupied.I don't want letters from my HOA. Sweep or vacuum as needed. Water yard. Schedule lawn care. Basically house needs to appear occupied.I don't want letters from my HOA. Sweep or vacuum as needed. Water yard. Schedule lawn care. Basically house needs to appear occupied. Looking for house sitting opportunities in Katy, Texas? Did you know that there are Katy area homeowners actively looking for people to live rent free in their homes while they are away for extended periods of time? 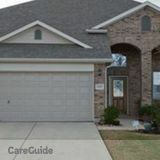 By creating a house sitter profile on this website you will have access to the unique house sitting opportunities in Katy and more! Many Katy house sitting jobs will even pay extra to have you take care of the pets, clean, cut the grass, forward mail or take care of any number of other daily chores.